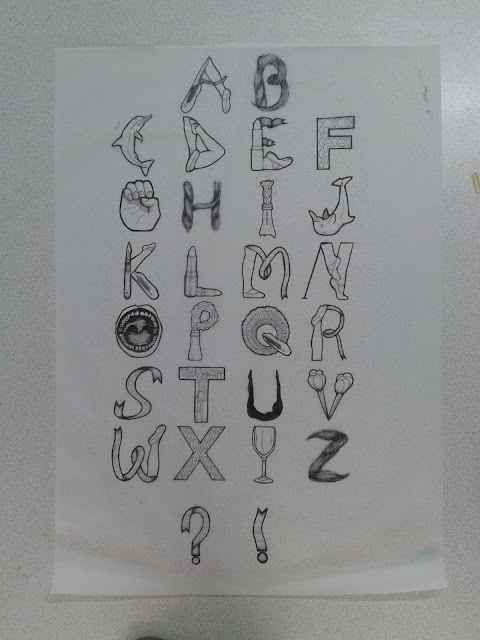 Firstly, the focus of this task was to produce an alphabet that portrayed my partner’s personality. In my research I noted down key points of Melissa’s personality, such as her favourite animal and hobbies. 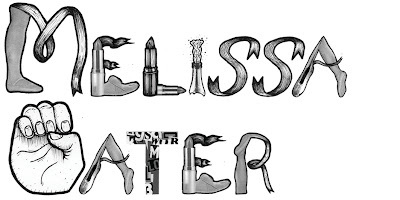 I wanted to combine illustration and collage to produce the letterforms as I believe this is best way of visually communicating Melissa’s personality. Below are the letterforms I produced. As a whole I think that the font achieves its purpose and portrays Melissa’s personality well. During the group crit (conducted on the day of our studio deadline) Melissa mentioned that the letterforms portray her character accurately, and all the main character traits such as her hobbies had been in included in the typeface. It was sometimes tough adapting objects to achieve a legible letterform, and still involve some aspect of her personality. 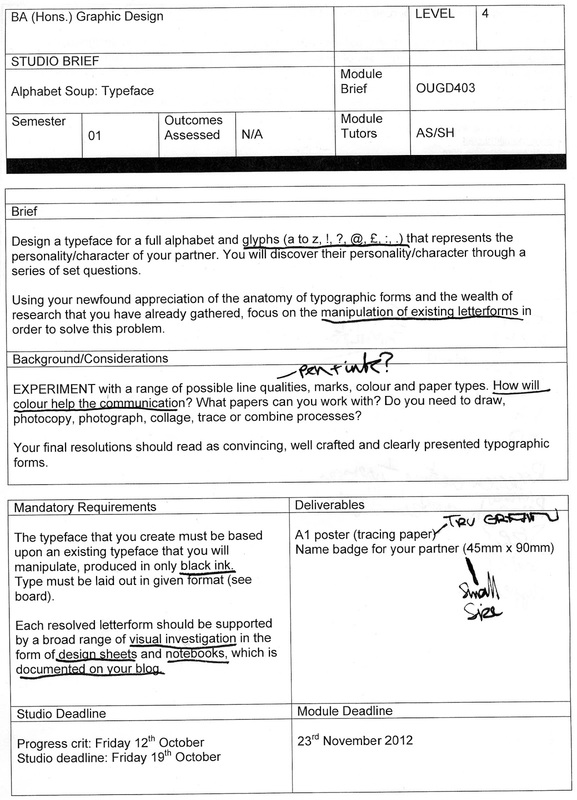 However, I overcame this problem by looking at what it was that prevented the letter from working, then re-produced the letter amending the prior mistakes. I continued this until I had a letterform I was happy with. 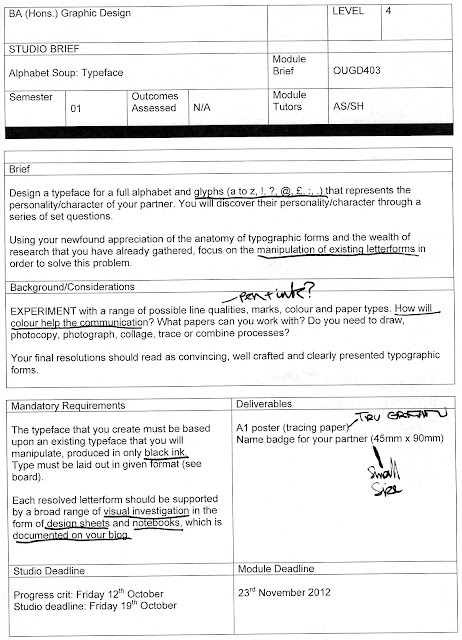 One of the mandatory requirements of the brief was that we produce an A1 sheet presenting our letterforms and glyphs. We traced our letterforms onto tracing paper and presented at our group crit, due to the nature of my letters this was a very lengthy process. Presenting my work in this way made me consider the sizing of my letterforms, fitting them on the sheet was not a problem as I produced my alphabet onto ten by ten squares. However, it did make me think about the sizing of my font. Would my letterforms still be legible at a small size? And what size would be best to present them? I discovered the answer to the first question when making Melissa’s name badge. I scanned in the letters needed for her name and began to scale them to the right size, they were legible however, and some of the illustration detail was lost. When I was designing the letters I made a point of utilising a thick black outline, I believe this helped the legibility of the letters when scaled down. Moreover, I made the choice to produce my letterforms in uppercase. I chose uppercase because of how I produced my letters. As I was mixing illustration and collage it would be very difficult to create small rounded lowercase letters. Finally, in the crit it was mentioned that my letterforms where more of a display font rather than a typeface due to a mixture of unusual form and detail, so some functionality is lost. Moreover, as single letters the objects hold no meaning and therefore have no function. 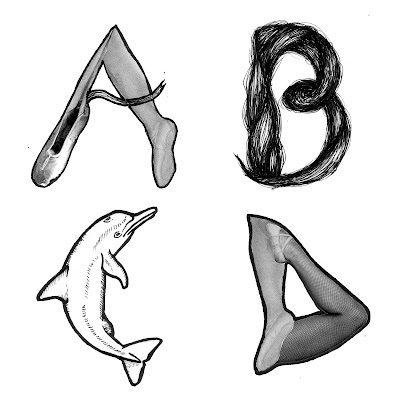 There are similarities between some letters but some words could look completely disjointed because of the range of graphic content. I believe next time I will produce an alphabet that not only achieves its purpose but also works as a typeface and display font.